Recently I stopped by Braeside Park to look for the reported Long Toed Stint, a tiny, rare, migratory shorebird. It was fairly easy to find with the help of other birders all lined up with their scopes looking for it as well. Eventually we found it working the mudflat on the main lagoon with a few Sharp-tailed sandpipers, a Pectoral sandpiper (another rare shorebird) and a bunch of Red-kneed dotterells. The Stint became my 350th Lifer and 348th Vic Tick. On the way back to my car I checked the car park area looking for the pair of Tawny Frogmouths that can usually be found in the trees around the cars. I found them on a low branch taking a bit of late afternoon sunshine. Always a favourite find in any location and a nice way to finish the successful twitch. 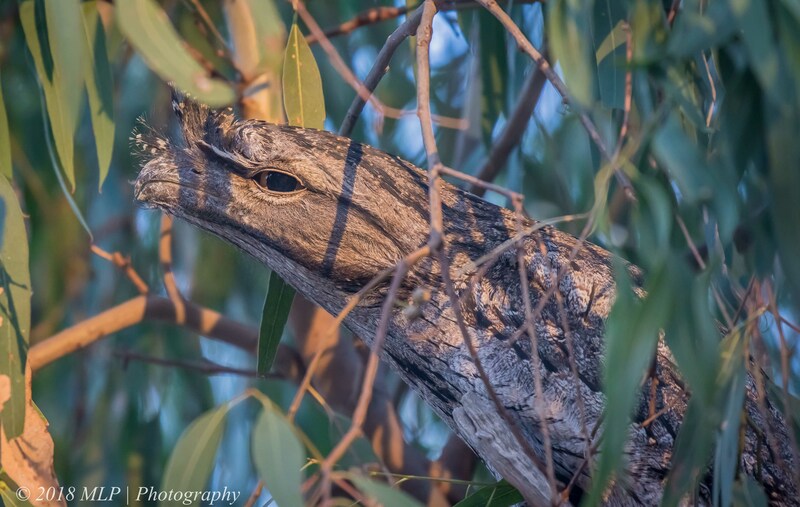 This entry was posted in Birds, Victoria and tagged Australia, Australian Birds, Bird Photography, Braeside Park, Lifer, lifer 350, Nature Photography, Photography, Tawny Frogmouth, Victoria. Bookmark the permalink. I’m glad you got the LTS too! I have never seen those frogmouths at Braeside! I have seen a pair up the other end of the park near the visitor centre and one very obvious one once on the way to the birdied. I will have a very close look around the cars in that carpark next time! we also have them on our campus in bundoora but beside the one famous pair at carparkk 7 I failed to find other ones, even I tried very hard to find them.